Above image: Social Business Replicated by Collaborative Economy, Ver 1.1If you’re a social business professional, you’re in a prime spot to advance your career to the next phase: the Collaborative Economy. For over ten years, I was a social business professional. I helped Hitachi launch their program as a full time employee in 2005, started this Web Strategy blog, joined Forrester Research, and became a founding partner at Altimeter Group. I saw the genesis, evolution, maturity, and integration of an entire market in less than a decade. Today, another decade later, I’m witnessing the birth, growth, and emergence of the next phase of social connection: the Collaborative Economy. In social media, people created media and shared it on social networks. In this next phase, people are creating physical goods in the maker movement and by crowdfunding, and sharing them in revolutionary movement that we call the Collaborative Economy. 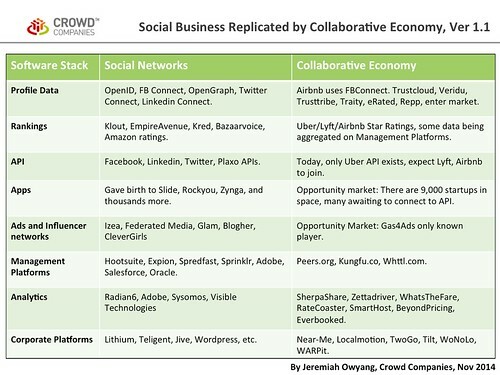 In the preceding graphic, you’ll see that many of the Social Business software players that I’ve researched are now replicating in the Collaborative Economy space, from profiles, data, APIs, apps, analytics players, corporate platforms, and more. I’ll be sharing this graphic and other data at my keynote at LeWeb in a week where I’ll be forecasting 2015 the Year of the Crowd. 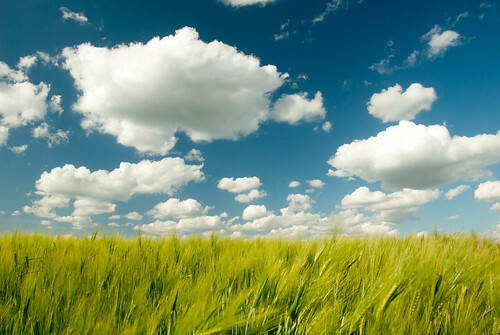 Social Business was a fast-moving industry that’s starting to integrate into corporations. If you saw how that industry birthed and grew, and were a leader or practitioner, you’re ahead of the pack and can grow your career in this next phase, the Collaborative Economy. If you thought peer-to-peer-based Uber, Airbnb, Lyft and Lending Club were disruptive, you haven’t seen anything yet. Previous revolutionaries have used pitchforks, wagon barricades, pamphlets, signs and drums. Today’s revolutionaries are using Firechat. It’s not just for revolutionaries, as I just downloaded Firechat. If you want to communicate during an emergencies, in the subway or on a plane, you can download Firechat too. Seven month old Firechat enables people to become the internet themselves by turning their phones into a network, bypassing access to the worldwide web. The preceding picture shows Hong Kong protesters “armed” with smartphones, using their devices as a single, united network to communicate, call in resources, talk to media, and tell their story globally – even when the government had shut down many internet services. This video tells first hand. Meet Firechat, the app for crowds, communities, and revolutionaries. Downloadable for free, Firechat enables you to chat with other people around you WITHOUT the internet. That’s right, it uses Wi-Fi and Bluetooth signals to create a “mesh network” where individuals can pass messages to each other on a peer-to-peer basis. It can also be used on the grid for further access. When it was first launched in March, Taiwanese protesters quickly adopted Firechat. When would such a use case be common? I had a chance to get some answers from Christophe of the Firechat team. The parent company is called Open Garden, which has the mission of: “…helping build a new decentralized mobile Internet.” The only way to stop Firechat is: Forbid people to download it (impossible through P2P file sharing), disabling power to a phone, or confiscating the phone. When it comes to speed, he told me that news broke of the closure due to weather at Burning Man on Firechat before it hit Twitter. In a remote area, the P2P network was stronger and faster. I asked the team, how safe and secure is it, really? They responded, “Firechat is a public chat app. Everything that you type is public. Our mantra is, ‘do not use your real name or type anything you would not want someone else to read,’ But give us enough time and you’ll see what we come up with…” They mentioned that, in the future, they may be able to develop new forms of verified identity. I’ve seen these emerge in now defunct apps like Honestly, which verified if you had a real LinkedIn account without disclosing your name or identity. It’s also key to note that Firechat requires density and velocity to work well, adoption strategy is key. Also, users must download the app –before a severe outage –meaning adopting is required. There’s two scenarios: People anticipating to connect while going off the grid while traveling, or two: in response to an emergency, opposition from powers. The software worked well in dense SF (the second most dense city in USA) but when off the grid in the suburbs there were not folks in immediate proximity available to create a mesh network, see screenshot. Expect Facebook, Twitter and Google to acquire or build these mesh technologies. Expect Facebook, Twitter and Instagram, each of which has been blocked by various governments, to develop this same P2P technology, enabling their experience to be shared all the time, regardless of a central power. A distributed network puts centralized telecom players on notice. This poses interesting questions to governments, internet service providers, telecommunication companies, and even marketers who rely on platforms like Facebook or Twitter. We’ve already seen the rise of FON, a peer-to-peer Wi-Fi device that enables people connect. This is more of the same. 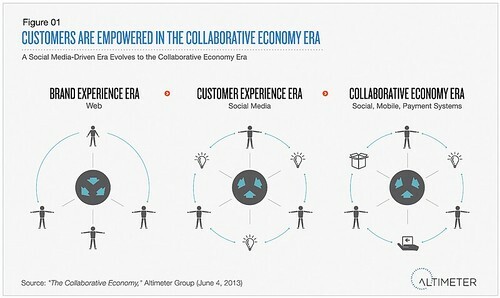 This is part of the continued trend of the crowd-based collaborative economy. I’ll likely include Firechat in some aspect of the next iteration of the Collaborative Economy honeycomb framework, as the next step is enabling people to share the physical world with each other using this P2P communications network. The bottom line: People are empowered to get what they need from each other using commonly available technologies. It means the crowd is becoming like an organized company – and that they will bypass inefficient institutions. Get your organization ready now. 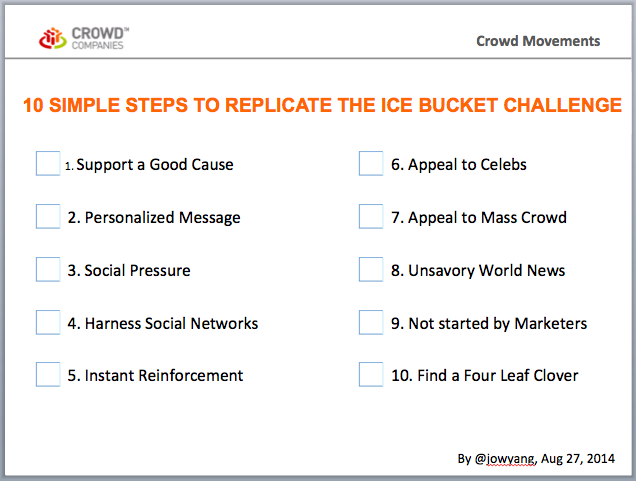 Crowd-based business models and marketing are no stranger to the Web Strategy blog –and now we’re seeing the same effect impact non profits, including the much discussed (and debated) ALS Ice Bucket Challenge. I was curious on the actual impacts of this controversial crowd challenge, and decided to tally up some of the numbers. In this above embedded slideshare, you’ll see facts on buzz, assumptions on water usage, influencer impact, money raised, and bottom line of total donated dollars. Also, in case you’re wondering, I was challenged by Scott Monty, I accepted the ice shower (over my garden –in a nod to our drought) and also donated to ALS —you can enjoy my washed up video, here. Lastly, top non profit thought leader Beth Kanter has questioned if this effort can be replicated, and even found other non-profits are emulating or “charity jacking”. Cruise through the embedded slides above –to see some of the stats of this crowd based effort. Update: Over the last few days, I’ve started to think about the causes of this blue moon event. I put together this handy guide, so if your boss, client, or charity wants to create their own, they have a simple ten step guide.